35% Off For Cathy’s Voice Readers, Honest! You are here: Home / beauty / 35% Off For Cathy’s Voice Readers, Honest! Honest Bundles are truly the best way to help you get premium, eco-friendly products — at the best price — with no hassle. Each bundle is totally convenient and completely customizable. You can mix and match all the products you need (and want), decide exactly when your bundle ships, and enjoy delivery to your doorstep — cancel anytime. And if that isn’t enough, you can also save an additional 25% OFF on up to 3 extra items added to any bundle! SPRING DIAPER PATTERNS ARE HERE! 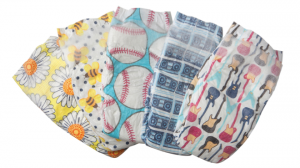 Enjoy the convenience of a monthly shipment of 6 jumbo bags of our Honest diapers – eco-friendly, ultra absorbent & free of lotions, fragrances & latex. Also included are 4 packages of our Honest wipes – all natural, soothing, super thick, “Cheek to Cheek” versatility (these wipes can do it all). Securely fitting moisture barrier cuffs prevent leakage and blowouts — fewer accidents, less laundry! For a limited time Cathy’s Voice readers can get an additional 35% off on first time bundles! Just enter promo code MARBUNDLES35OFF at checkout. Please note this can only be applied to first time bundle purchases. Discount does not apply to Add & Save Items. Offer valid 3/9/15-3/15/15.